In the past hundred years, Alabama has moved from a farm economy to an economy based on manufacturing, military bases and communications, and the products that are now shipped to and from Alabama are more varied than ever. From the Gulf of Mexico to the Appalachian Mountains and from forests to factory farms, Alabama’s landscape is as diverse as its population. Alabama creates products that are shipped all over the nation, from the east coast of Florida to the west coast of California. FRC Logistics can arrange for shipping within, to and from Alabama. The first step is to access a Quick Quote from our web-based estimating software—or just call us at 855-372-7447. Alabama has freight shipping services to match its diverse economy, with a wide variety of trailers and specialized rigs available. 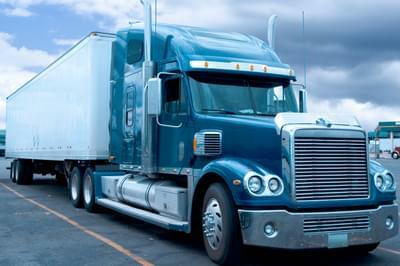 Many of the best Alabama trucking companies are FRC Logistics’ partners. Freight Rate Central only works with dependable, professional Alabama freight companies, and we negotiate the best rates available for all our clients; often we are able to offer shipping rates 75% below the prices that Alabama trucking companies quote if queried directly. 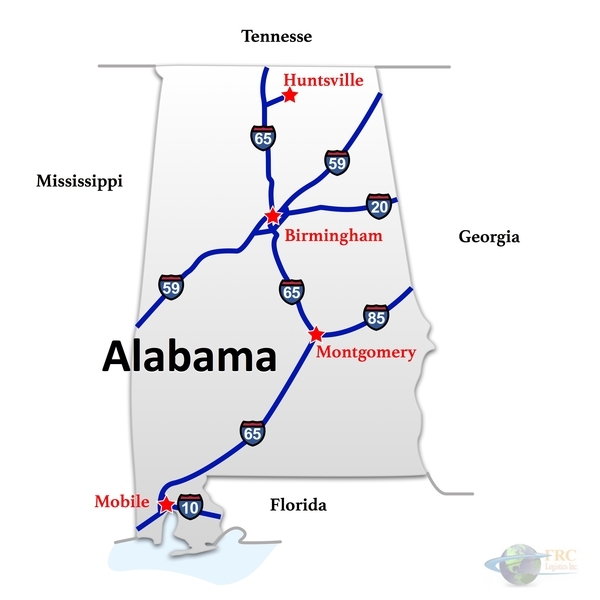 All of Alabama’s major cities, including Birmingham, the largest city; Montgomery, the capital; Huntsville in the north and Mobile in the south, are easily accessible by Interstate. Alabama is bordered by Mississippi to the west, Georgia and Florida to the east and Tennessee to the north. Because it is a southern state, ice and snow are seldom concerns in Alabama shipping. However, the summers can be dangerously hot, and the storms can be extreme. Thunderstorms and tropical storms are common, especially in the southern part of the state, and hurricanes and tornados can also be hazards in Alabama freight shipping. The southern end of the Appalachian Mountain chain can be found in the northeastern part of Alabama and can pose shipping challenges, too. When most people think about Alabama industry, they think of agriculture first. However, agriculture makes up only a small percentage of Alabama’s twenty-first century economy. Today’s Alabama manufacturing economy is dominated by automotive manufacturing, aerospace, steel fabrication and the development of natural resources, including mining and timber. 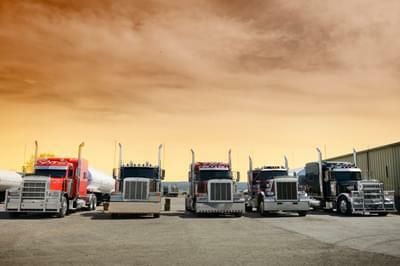 These industries have created heavy demand for Alabama trucking. Alabama freight shipping to the east coast through Georgia and Florida offers a gateway to the Atlantic Ocean. Alabama trucking to Mississippi opens up the center of the country to Alabama products. Alabama ships its goods to the west, as well: shipping corridors from Alabama to Texas and California are heavily used. East to west and south to north, Alabama supplies other parts of the US with raw materials and finished products. The Alabama Department of Transportation (ALDOT) regulates Alabama freight shipping, and FRC Logistics works closely with ALDOT to make sure our Alabama freight services have all the necessary permits and stay on schedule. For normal loads, Alabama limits trailer length to 57 feet, height to 13’-6” and width to 8’-6” for most roads. Weights up to 80,000 pounds are allowed without a special permit. Oversized loads are up to 16’-0” in width, 16’-0” in height and 150 feet in overall length; super loads surpass that. For oversized loads and super loads, ALDOT requires calculations for the weight on each axle. Alabama freight shipping centers on the state’s well-placed network of interstate highways, including I-65, I-59, I-20 and I-10. In Alabama, most potential delays are due to construction, tropical storms and tornadoes. FRC Logistics works hard to anticipate and mitigate possible delays, keeping your shipment on schedule and on budget. For Alabama shipping through FRC Logistics, start with a Quick Quote or a quick phone call to 855-372-7447.